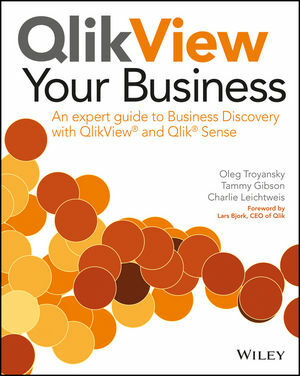 The Qlik platform was designed to provide a fast and easy data analytics tool, and QlikView Your Business is your detailed, full-color, step-by-step guide to understanding Qlikview's powerful features and techniques so you can quickly start unlocking your data’s potential. This expert author team brings real-world insight together with practical business analytics, so you can approach, explore, and solve business intelligence problems using the robust Qlik toolset and clearly communicate your results to stakeholders using powerful visualization features in QlikView and Qlik Sense. This book starts at the basic level and dives deep into the most advanced QlikView techniques, delivering tangible value and knowledge to new users and experienced developers alike. As an added benefit, every topic presented is enhanced with tips, tricks, and insightful recommendations that the authors accumulated through years of developing QlikView analytics. The book covers three common business scenarios - Sales, Profitability, and Inventory Analysis. Each scenario contains four chapters, covering the four main disciplines of business analytics: Business Case, Data Modeling, Scripting, and Visualizations. Introducing Qlik Sense - how it is different from QlikView and what is similar? Whether you are just starting out with QlikView or are ready to dive deeper, QlikView Your Business is your comprehensive guide to sharpening your QlikView skills and unleashing the power of QlikView in your organization. OLEG TROYANSKY is the President of Natural Synergies, the first North American BI firm that was created with the focus on QlikView solutions, services and education. He is a well-known QlikView educator and advocate, a 2014 QlikView luminary and a speaker at the Masters Summit for QlikView. TAMMY GIBSON is a Senior QlikView Consultant at Natural Synergies. She's been developing QlikView solutions since 2004. She is also the co-founder and CTO of VenueCube, a company providing business intelligence analytics to entertainment venues and convention centers. CHARLES LEICHTWEIS is a Senior Advisor of Phoenix Strategic Advisors and the head of their Sustainable Profitable Growth Practice. Charlie has led companies in a variety of "C" suite roles in a career that spans 30 plus years. He holds an MBA in Operations Management, and is a CPA and CMA.